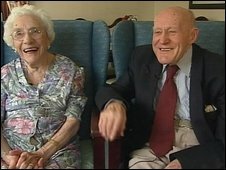 One half of Britain's longest married couple has died at the Plymouth residential home where he lived with his wife of 81 years. Frank Milford met Anita, both 101, at a YMCA dance in Plymouth, Devon, in 1926 and they married two years later. The couple said the secret of their marriage was "give and take" and making up after rows with a kiss and cuddle. Mr Milford's 76-year-old son, who is also called Frank, said his mother was holding his father's hand when he died. "She's very upset obviously, but she was sitting holding his hand when he passed away," he told BBC News. "For the past three weeks or so he hasn't been eating or drinking and I think we all realised he was ready to die. "He knew it was his time and I think he simply died of old age." Despite his frailty, Mr Milford said his father had remained "as sharp as a tack" and never lost his sense of humour. Frank and Anita Milford spent their entire married life in Plymouth and stayed in the city throughout World War II. During the Blitz they narrowly escaped two bombs, including one which fell on their house. Frank and Anita Milford had two children, five grandchildren and seven great grandchildren. 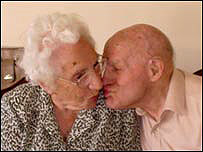 In February 2010 the couple would have broken the record to become the oldest married couple in Britain.